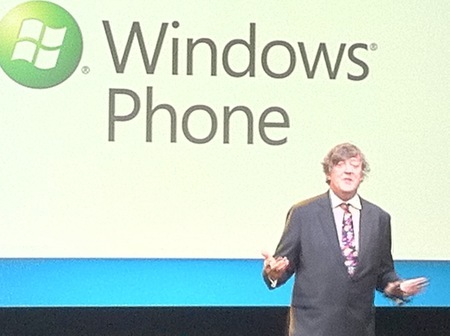 Stephen Fry was one of the first people in the country to fall for the “delightful” new Windows 7 phones and he came on stage at the UK press conference to tell us just how much he liked it. And he was not getting paid for this he said. After comparing Windows phones to 60s tower blocks back in 2005, he is ready he says, to give them another go. The phone he got was sleek and liquid he said – we think he had the HD7, and he was looking forward to keeping it. That doesn’t mean he’s giving up his iPhone though – he said he was planning to have this in one pocket, an Android in another, the iPhone and various other hot handsets in several others. How many pockets does this man have? Much though he is a charmer though – believe me – this was the best presentation I’ve seen at press conference errr ever, I wasn’t exactly wowed by his line of argument – which boiled down to “well it’s nice to lots of different phones on the market, gives us all a choice”. UM THAT DOESN’T MEAN THE PHONE IS ANY GOOD. Oh and no way is Microsoft an underdog..